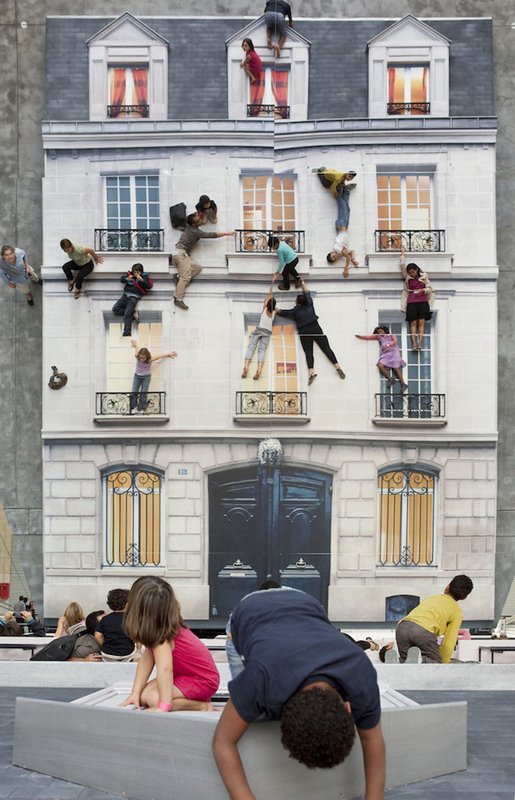 Leandro Erlich's installation called Bâtiment now on display at Le 104 in Paris looks like so much fun. A gigantic mirror reflects a house which gives visitors the illusion that they can hang off ledges and if kids (or adults) want, they can even get their Spiderman crawl on. Buenos Aires based artist Leandro does brilliant work, I mentioned him in this post and think he is the ultimate artistic illusionist. Watch a little clip here to see how it is done. Amazing. oh my goodness, so cool! this reminds me of the chalk art with all the depth perception, except that the mirror's probably shinier! The thumbnail of this image is crazy. I couldn't work out what was going on. love it! this looks awesome! I'd love to try that out! This is so cool!! It took me a few minutes to figure out what I was seeing and how it was done! What a neat trick! Would be wonderful to see more playgrounds like this! That's freakin awesome. Thanks so much for sharing! This looks amazing. I'm going to Le 104 in a couple of weeks and can't wait! oh my god...i would LOVE to hang out and play here! so awesome! Love real-life illusions! That installation rocks! Insane. Looks like they're all doing that on a real building. I love this! I'm always on the search for amazing and creative artwork like this to inspire me. I posted about this and linked to your page over at www.justaredletterday.com!